Borderway Agri-Expo has been selected for 2012 as one of the nominated shows for the Walkers Shortbread Aberdeen-Angus Show Herd of the Year Competition 2012. The competition between Scotland originating Aberdeen-Angus Herds is aptly sponsored by Scotland’s own biscuit company Walkers Shortbread Ltd. The sixth Borderway Agri-Expo to be held on Friday the 2nd of November is home to a number of cattle society shows, however this is the first time the show will see biscuits and beef come together for what is sure to be a great competition. The trophy and £500 prize money is based on points awarded to exhibitor bred cattle placed 1st, 2nd or 3rd in the Aberdeen-Angus section at ten or eleven selected shows which vary annually. 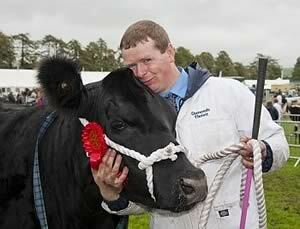 This year’s selected shows include the Royal Highland Show, Royal Welsh Show and the Great Yorkshire Show. “It is great to see Borderway Agri-Expo being seen as a platform for large breed society shows and competitions. The Walkers Shortbread Aberdeen-Angus Show Herd of the Year Competition is a brilliant example of how the best of the best come together at Agri-Expo. This is an accolade that rewards the ultimate in Aberdeen-Angus breeding as it goes to the best herd, not individual animal – a testament to an excellent breeder or farmer”. Held at the Borderway Exhibition Centre in Rosehill, Carlisle the event has grown into a major platform for both sheep and cattle society national shows. Borderway Agri-Expo attracts over 10,000 visitors every year and has grown significantly since its inaugural event in 2007.